Falling objects is a common safety issue in the workplace. Falling tools are dangerous. 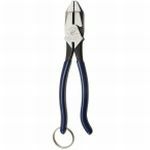 Even a small object falling from a height can cause serious injury or damage.These side cutting pliers feature a split ring for tethering pliers while working at height. 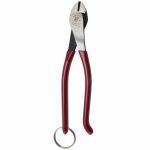 All of the features of Klein pliers plus the added safety of a tether ring. The high leverage design provides greater cutting and gripping power.